Description: Magicians, lions, mysterious atmosphere and shimmering of sequins… Night reveals the wild side of circus and its bizarre, seductive and beautiful performers. 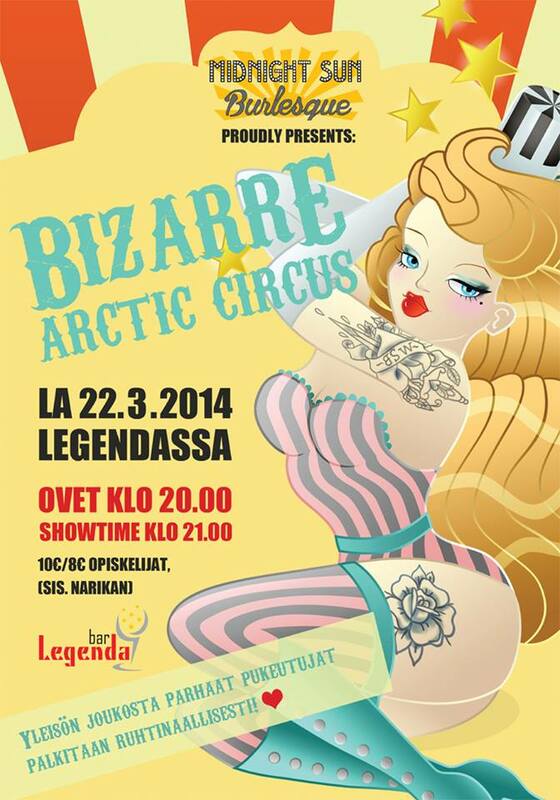 Welcome to experience the first burlesque event in Rovaniemi! The doors are open from 8.00 pm and our beautiful performers step on the stage at 9.00 pm. Now it is time to create yourself a fantastic costume that fits for our bizarre arctic circus! We have a costume contest and the winners are picked from the audience. So you may win great prizes just by coming to the event dressed amazingly. Tickets are sold from the door at the time our event starts.The tickets cost 10€ and for students 8 €, including cloakroom. Our event is prohibited for people under 18. Unfortunately taking pictures at the event is not allowed unless you have a permission to do so. You may ask a permission to take pictures from Eeva: eevasnygg @ gmail.com.